New Page Books, 9781601633705, 224pp. Almost half of Americans struggle with illness--everything from heart disease, diabetes, and lupus to fibromyalgia, rheumatoid arthritis, cancer or chronic pain. More than a third of our population is obese. As a nation, we are sick--and getting sicker, but it doesn't have to be that way. So instead of prescribing a specific treatment, diet, or exercise routine, Everyday Healing provides daily action steps to help you eliminate old habits and establish new paths to health. 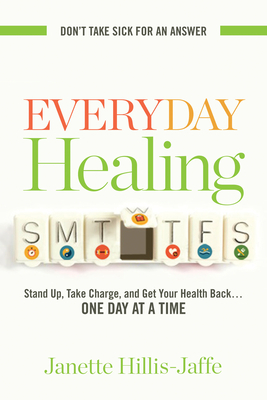 It offers practical guidance on overcoming healing challenges--from organizing your kitchen in order to cook healthier meals and boosting your confidence that you can heal, to having a tough conversation with an unsupportive spouse. Personal stories and medical studies that demonstrate the power of each daily action step. Tips to research and evaluate new treatment options effectively. Tools to manage tough emotions and create a fabulous support team. Organizing principles to routinize healthy eating, sleeping, and exercise. Janette Hillis-Jaffe combines her personal experience as a patient with her background as a public-health professional to help others chart a course out of illness into health. Janette is a sought-after speaker, consultant, and coach, with a masters in public health from the Harvard School of Public Health. She has spent thousands of hours studying counseling, nutrition, the mind-body connection, and the U.S. healthcare system during her successful effort to heal from her own six-year debilitating autoimmune disorder. Having recovered her health, she lives in Sharon, Massachusetts and supports others to lose weight, ease chronic illness, recover from acute illness, and overcome persistent pain. For more information, please go to www.healforrealnow.com.